The creators of Memrise – a free, online language learning program – have recently released a wonderful app called CatAcademy. The app, which teaches Spanish through entertaining pictures of cats, is quite ingenious and definitely worth downloading for anyone wanting to learn the basics of the language. I attended a wonderful panel last week that talked about the globalization of mobile apps and games. Based on their conversation, the mobile gaming industry is growing at high velocity. Although opinions differ, it’s been speculated by many that by 2015, the industry's annual revenue is expected to reach $50 billion. For companies trying to maximize their piece of that pie, dominating secondary markets is a critical strategy. Google has made its 2-step verification process for all Google accounts available in 40 languages and in more than 150 countries! Why should you be limited to learning very basic vacation phrases? iPhone app developers are on a roll! It seems we’re introduced to a new translation app every week, and the month of February was no different. Today, Verizon Wireless stores nationwide began selling the iPhone 4. And on this day, I’d like to take the time to gab about a newly introduced app: the Google Translate app. Android features English to Spanish "Conversation Mode"
New to Android phones is the Conversation Mode feature, where users can speak with their foreign-speaking friends in real time. 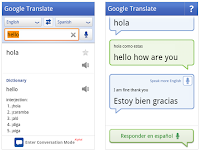 Conversation Mode uses Google’s machine translation technology to convert the spoken word from English into Spanish, and vice versa. I’m recently back home in Seattle after taking my wife and kids to Europe for what turned out to be an amazing vacation. As an avid iPhone user, and manager of a small business, it was imperative to stay well-connected to the office during the trip. Plus I wanted to use the iPhone as the great travel tool it is. With those goals in mind, I did a fair amount of research to make sure that I didn’t end up with zero data coverage, nor a horror story 4 digit phone bill because of international data roaming. Shortly before our trip, I purchased a shiny new iPhone 4 (which I absolutely love, but that’s another blog post), however, I still had my iPhone 3G. It was definitely my preference to use the iPhone 4, but knowing that the iPhone 4 has a new type of SIM card (micro SIM, I believe), and that it might be challenging to get SIM cards of that type in Europe, I decided to go with my 3G for the entire trip. Another factor in that decision is that my 3G was already a “jailbroken” phone with the software unlock, meaning I could use a SIM card from any network provider in it. Also at that point, there was no reliable jailbreak solution for the iPhone 4, though that has now changed (As of mid August, 2010). Our itinerary included stops in Paris, and 3 different islands in Greece. Step 1 in the plan was to identify a coverage provider that could provide 3G data coverage at our first destination, Paris. The way I did that was to briefly turn on my iPhone 4 upon arrival at Charles de Gaulle airport, turning on Data Roaming support, at which point my phone quickly connected to “Orange” and the coverage was 3G. Hooray! I knew the rates for this were exorbitant, but I had already turned off e-mail functionality, and planned on using a bare minimum amount of data. After using Google Maps to find our apartment in Paris, I then used Maps to find the closest “Tabac” or Tobacco Shop, which sold both pre-paid SIM cards and card refills. I then put my iPhone 4 in "Airplane Mode" to ensure that there wouldn't be an billing surprises. In my pre-trip research, I often read that you can get SIM cards at these Tabac shops for 15 Euros or so, but what I didn’t realize is that not all SIM cards are created equal. If you only want phone minutes and text messages, you can probably do fine with a generic card from a Tabac. But it was critical to me to have a significant amount of data usage available for my iPhone during our stay, plus 3G support. So, after speaking with a helpful Tabac owner, he directed me to the closest Orange store. There, I was able to purchase a pre-paid SIM card for 15 Euro, with cash and info from my American Driver’s license. I turned it on in the store, verified connectivity and coverage, and I was on my way. What they did not tell me at the time, is that unless you modify your rate plan on these pre-paid cards, you burn through your Euro credits at a ridiculous rate of about 1MB per Euro – I’m not sure exactly how it is, but suffice it to say that within a day I had a text message from Orange letting me know that I needed to re-fill my account. At that point, I returned to the Orange store, talked to another representative, who kindly let me know that for 12 Euros, they offer a plan called “Internet Max”, which amounts to unlimited data usage for 12 Euros per month. I happily added 15 Euros, and activated that plan with his help. From that point, whenever we were out, we used the iPhone constantly to help with the trip doing everything from helping us navigate the Paris Metro, find restaurants, plan our itinerary, plus we used a couple of audio tours from Rick Steves. I should mention that we did have free wifi coverage at our Paris apartment, and obviously used that when we were there for both our iPads, iPhone and computer, but around town, we depended on iPhone coverage. Further, we didn’t spend a lot of time relaxing in cafes, so we didn’t make a huge effort to find free wifi places around town. When we arrived in Athens, the phone connected to “Cosmote” with a 3G connection, so that was my next target. In Athens, we were staying at a hotel that offered wifi availability on their website. I neglected to verify the costs for that before we booked this place, and received an unpleasant surprise that their rate structure for wifi was “15 Euro per day, per device” So, it was pretty unrealistic to connect two iPhones, two iPads, and a computer for the two days we were there – not that we really would have, but still I really didn’t care for their policy. I left the store, and neglected to verify that data coverage was working – it wasn’t. This continued to be a problem until I spoke to an English speaking support rep on the phone, who activated their “60” plan. Unlike Orange’s unlimited internet plan, what Cosmote had to offer was 120MB of data for 3 Euro, and she said it could be renewed if I ran over my allotment. For me, this ended up being fine, and I never did need to reload during my two weeks in Greece as I limited my data usage there to periodically checking e-mail, and never doing data heavy things like picture MMS messages or uploading videos. Again, we had 3G coverage, and wifi availability in most places. One note, in Oia, on the island of Santorini, we stayed at a fantastic little hotel, that also said it offered wifi. Unfortunately, it was on the same basis as the Athens hotel with a slight twist – you purchase a 15 Euro wifi card that gives you a code that, once activated, is good for 24 hours, supporting only a single device at a time. Not ideal, and I only needed to utilize that service for a single 24-hour period, thankfully. I had good coverage throughout Paris and Athens, and for most of Oia. Our last stop was the island of Kalymnos, and Cosmote coverage was good there as well. Not nearly as much 3G coverage as elsewhere, but I was almost never without signal. One final topic – I’ve only talked about Data, and not phone and texting yet. The solution I decided to go with for being reachable via phone and text was a blended solution via Google Voice and Skype. I’m rarely on the phone anymore, but still wanted friends and work colleagues to be able to reach me. So, I set it up this way: I had my iPhone 4 set up to forward all calls to my Google voice number. Then, I set up Google Voice to forward all calls to my Skype phone number (a U.S. number), which was then forwarded to whatever SIM was active in my iPhone 3G. So, I had one number in France, and another in Greece, but could receive calls via my main US phone number. The reason I chose this method was that any calls that went unanswered, I would still have a centralized place to receive voice mails (Google Voice) and also still receive transcribed versions of voice-mails via e-mail, and I also didn’t have to go through the hassle of notifying key people of the best way to reach me as I changed numbers. All in all, I’m happy with how it worked out. Have you had similar experiences with phones when traveling? Feel free to add a comment or question below! Apple has finally released their highly anticipated iPhone 4. The new phone shows off a host of exciting features and a slick new style.